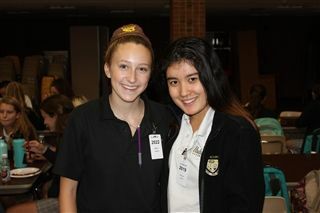 Rooted in Padua Academy tradition, the Big Sister Little Sister Program is a unique experience fostering connections between freshmen and seniors and strengthening the bonds of sisterhood and service. Padua sisters enjoy some of the following events throughout the school year: Sisters on the Steps, Locker Decorating, Beanies & Breakfast, Charity Gift Auction, Trivia & Treats, and a Legacy Ceremony. The Big Sister Little Sister Advisory Board is a student-led committee working closely with moderators to plan and implement events.